Girl power activate! A new brand for our future female leaders. Girls are not about ponies and the color pink. They are tough, smart, creative and powerful. 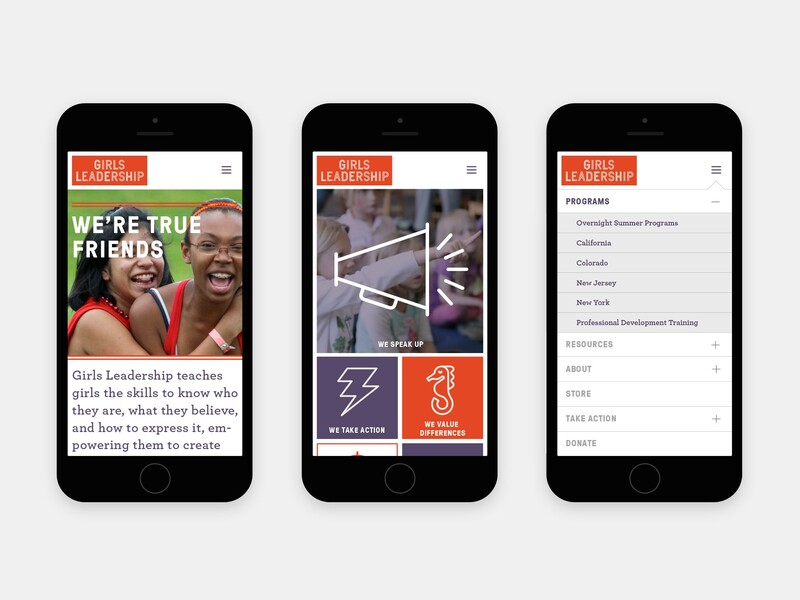 Girls Leadership asked us to imagine a rebrand that reflects the ambition and strength of the organization, then construct a new website to better communicate this and connect people to its rich offerings. Through intimate collaborative workshops with the Girls Leadership staff, we pinpointed two main goals: 1) To create a brand that has more authority but retains a childlike exuberance, and 2) Expand the reach of Girls Leadership’s resources and curricula. In response to this strategic positioning we first created a brand that has an immediate simplicity and boldness, but upon deeper interaction reveals more nuance and personality. Then we redesigned the website to be more immediately impactful, while putting the Girls Leadership offerings up front and better organized. A downloadable poster is offered for free to anyone who wants to hang it in their bedroom, classroom, office, wherever. Just wanted to share with you some of the great feedback that we are getting on the site. People feel the content is well-organized — doesn’t feel overwhelming, flow is intuitive. From our board to our audience, folks are way impressed with your work.